We’ve been at sea for two months now. After having explored the coasts of New Caledonia, we set sail for Vanuatu where we arrived on Tanna island, at the foot of the volcano Mount Yasur. We watch it smoke, and at night we observe its red crater reflected in the clouds above our heads. It’s amazing to be able to move our house from a Caledonian island like Lifou, in the Loyalty Islands, to the foot of a volcano in Vanuatu! Life on board follows its own rhythm. The children call the boat “home” and Marjorie and I have both found our bearings as much with manoeuvring and navigation as with the household chores. This didn’t happen overnight, though; it took us several weeks, over a month in fact, to get organised. 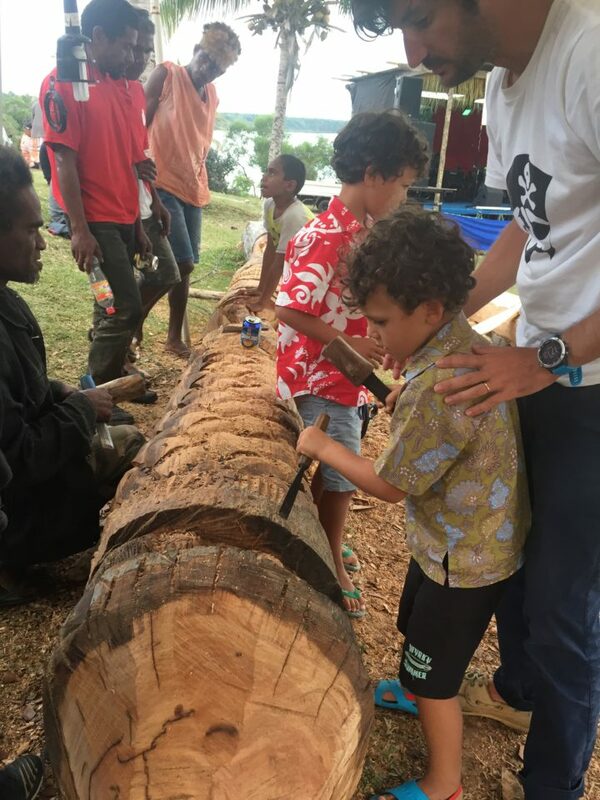 The first few weeks we busied ourselves preparing the boat, spending hours in shops in Nouméa looking for all our daily necessities, as well as going food shopping to stock up on basics, knowing we would only come across small fruit and vegetable markets along our way. We were surprised by how long these preparations took, both during our regular stopovers in Nouméa and while at sea, during which we put the technical final touches to the boat. 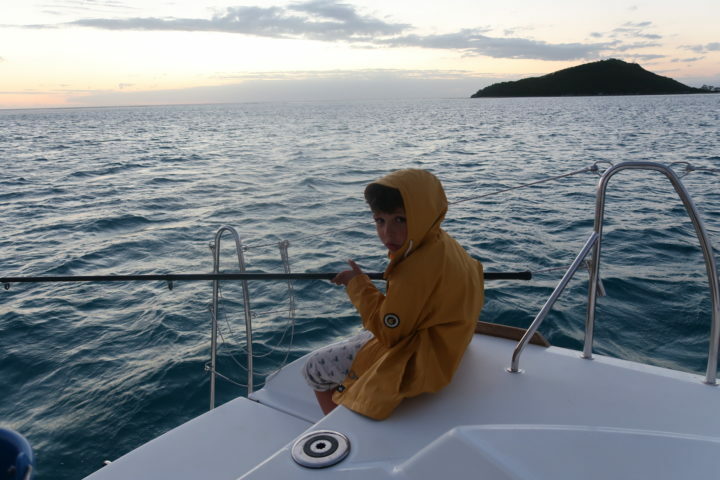 We often wondered when we’d find the time to home-school the kids or enjoy the activities we’d planned before leaving: spearfishing, diving, fishing, yoga, painting and reading to name a few. After all, one of the main reasons behind our trip was to devote more time to our hobbies. The days flew by and we were busy from morning to evening with household chores and technical work. It was at this point that our first guests visited us on board: my sister, her husband and their six-month-old baby. Their arrival really flicked a switch, helping us to look up from what we were doing, forget about the preparations, and take the time to just enjoy ourselves. 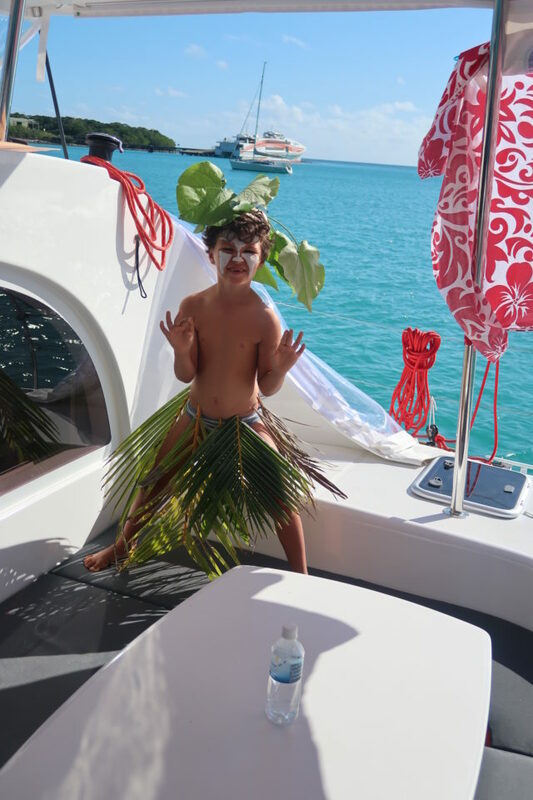 It was fantastic to have guests on board, to introduce them to our floating home and to have a baby babbling and entertaining Ulysse and Titouan. We’d spent five weeks in isolation, just the four of us, 24/7. Their visit was a breath of fresh air for all of us. From then on, we went from the preparation stage to the travelling itself. We chose to start home-schooling the kids around mid-August, before the official back-to-school date, because we knew that we wouldn’t be able to maintain much of a rhythm. It’s certainly tricky to give lessons during crossings due to the regular watches, and sometimes rough weather can make things even more difficult. 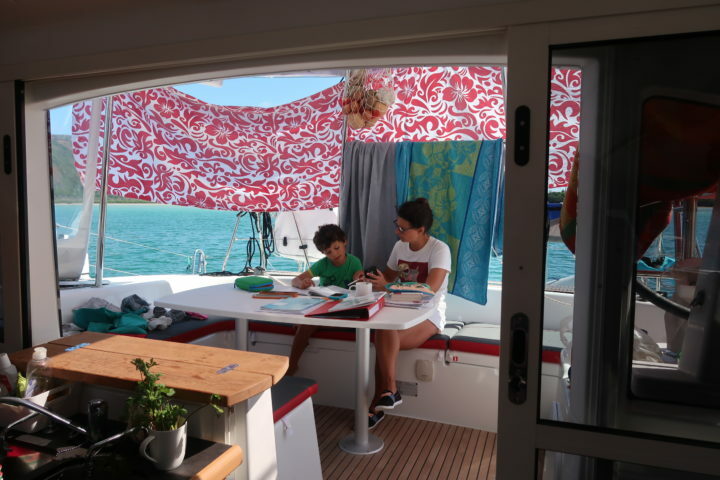 Also, when people visit – several members of our family and friends have planned to come and spend a few weeks on board – it will be difficult to devote the requisite five hours a day to the CE1 programme (Year 3) for our oldest son Ulysse. As we’d anticipated, playing the role of teacher is no walk in the park! Once again, it took us several weeks to get organised and to find the right teaching method, not to mention the necessary level of patience. We haven’t established any particular daily rhythm because each day, each mooring, brings with it new adventures: discovering an island, meeting local people, maintaining the boat, fishing, cooking, sailing, all of these set the pace. We get up early and go to bed early too, following the sun’s rhythm. We make the most of each quiet day to make headway on the school programme, barely thinking about the actual days of the week. Three hours in the morning, two in the afternoon, punctuated by plenty of breaks: swimming, reading, cooking, board games, drawing, playing football on the beach or (thank you, catamaran!) trampoline!! 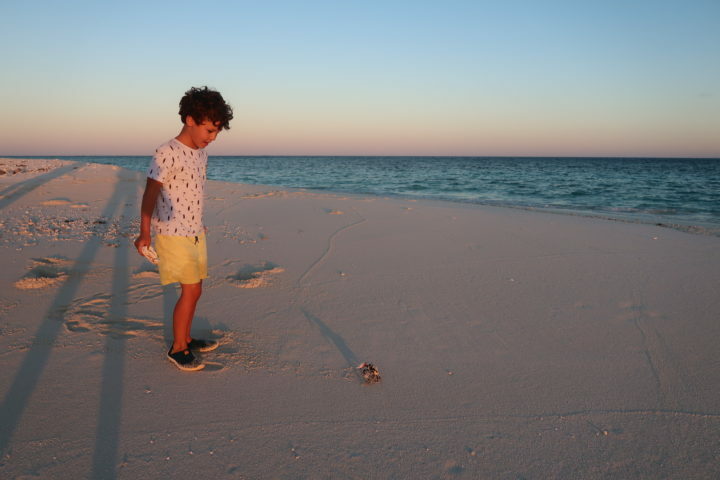 We also use all the countless opportunities we are presented with to bring our lessons to life, together discovering the marine world, plants and snakes and even star gazing. We call ourselves “sea explorers” and tell them stories of the first European sailors who sailed the same routes as us, such as James Cook and Bougainville. It’s a blessing to see our two boys growing up in such a unique environment. From being ill-adjusted, noisy and restless in the first weeks on board, they are now turning into real seafarers: agile, resourceful, independent and always curious and playful! 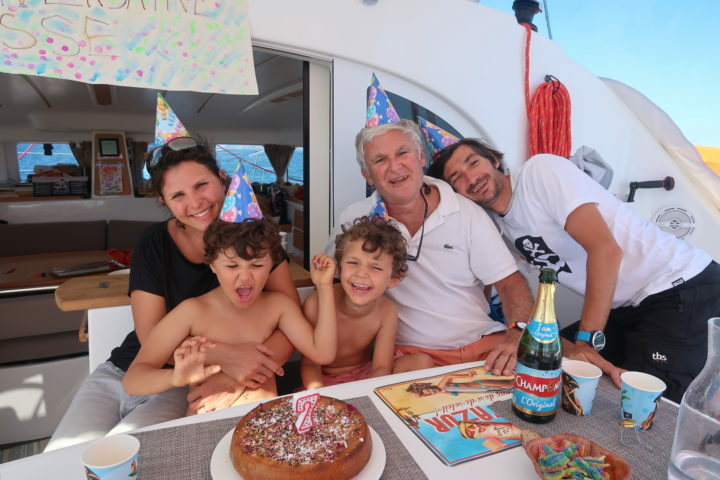 We will soon be welcoming their grandfather on board for a few weeks, in perfect time to celebrate Ulysse’s seventh birthday together. We’ll set off and explore Vanuatu as a family! 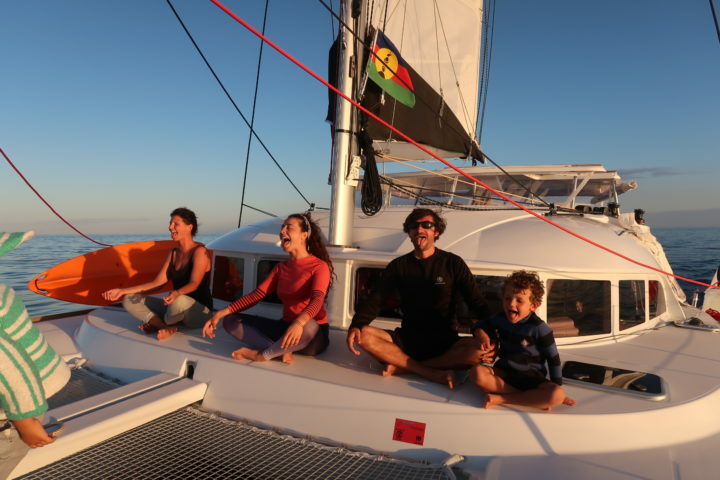 Thibaut, Marjorie, Ulysse and Titouan, on board Ganesha. Wonderful pictures. 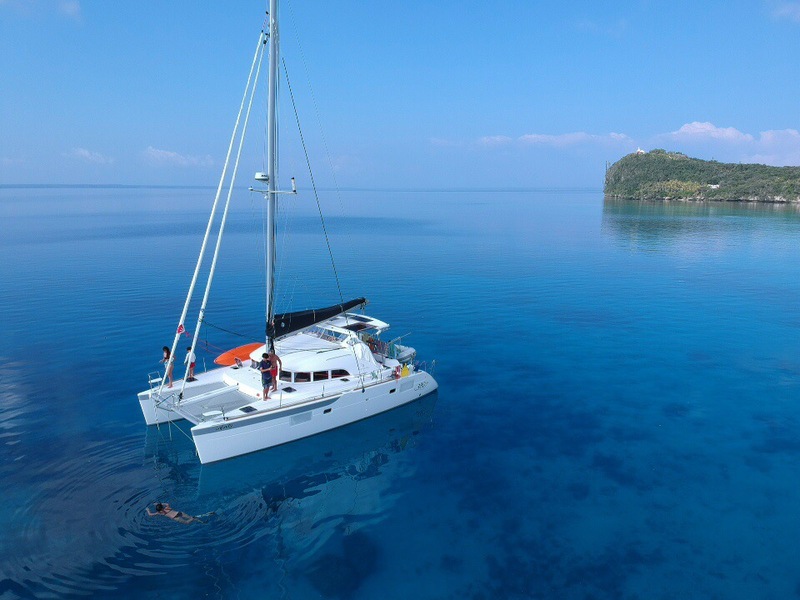 I think Lagoon 380 is best in class catamaran. Reliable and simple.